Brandon Torimaru led the Rams with a game high 21 points. (Temple City) — Brandon Torimaru scored a game-high 21 points and Tag Folk collected 10 rebounds in Temple City’s 49-36 win over Flintridge Prep in the opening round of the Division 4AA playoffs Friday night at Temple City High school. Making those shots and forcing the stops was the reason why the Rams jumped to a quick 7-0 lead to open the quarter. Folk led the way for the Rams by grabbing five rebounds and scoring six points in the first quarter. On Defense, TC’s 2-3 zone smothered the Rebel’s offense. Zach Kim and Matt Ho were able to make some noise on offense but the rest of the team couldn’t follow. The trend of forcing shots continued for Flintridge in the second quarter while on the other end Torimaru and Elton Lo were able to find a groove on offense increasing their lead up to double figures before the half-time buzzer. Following the break, the Rebels were able to cut into the lead and pull within five. 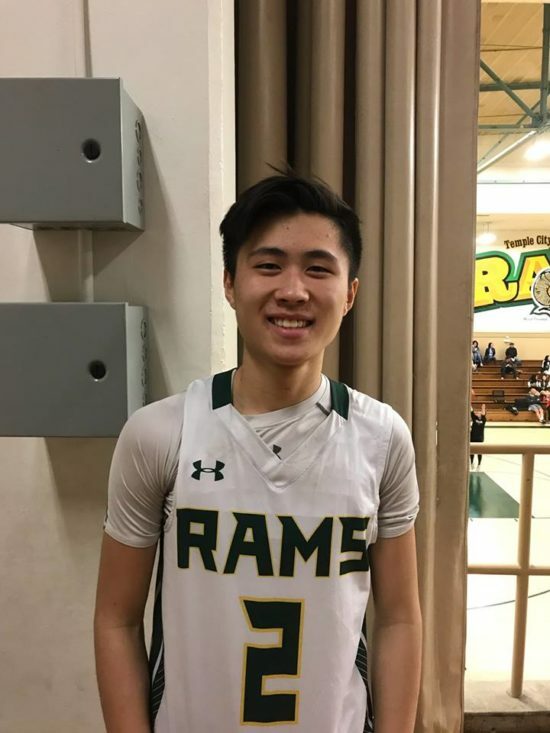 John Lytle, Kevin Ashworth, and Ho found the bottom of the net from behind the three-point line to aid Flintridge in outscoring the Rams in the third quarter. After three quarters, the Rams entered the final frame up 34-29. Just like the first quarter, TC’s three-point shooting took over and their five-point lead jumped to 11 after Patrick Ekmekjian and Torimaru nailed back-to-back threes which also sparked a 10-1 run within the first two minutes of the fourth quarter. The Rebels offense was able to generate some offense thanks to Ashworth’s three-point shooting but by then it was too late for a comeback. With the win, Temple City will play Fairmont Prep next Tuesday. 2 Comments to "Torimaru’s Triples Top Rebels"
Bt way to go nephew, ballin like your uncle j, so proud, do your thing boy. Congratulations TC. But those jerseys look like they were done with magic marker.